Create Accelerator Requests in the Help Portal. Explain your role in the Accelerator Delivery process. Now that you’re familiar with the Accelerator Library and know how to find the perfect Accelerators for your organization, it’s time to actually submit the request in Salesforce Help. Only Designated Contacts with the right permissions can do this. If you need a refresher on navigating Salesforce Help, see the Salesforce Success Cloud Basics module, and for more on Designated Contacts, check out Premier Success Plans. 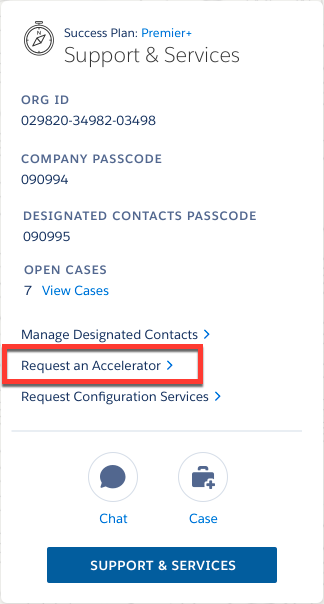 If you’ve got the required permissions, there’s a Request an Accelerator link waiting for you right on the Salesforce Help home page. Let’s walk through the request process. Browse through the Accelerator catalog. You can filter by catalog and product to narrow your selections. When you find one you’re interested in, click Request to get started. Fill out a few key details on the request form. Take the time to provide accurate information as it will set the stage for a great delivery. Use the Catalog filter to view only the Accelerators in your Success Plan. Remember that Marketing Cloud and Pardot each have their own Success Plans and Accelerator catalogs too. Requested Start Date is one of the fields on the request form. This is the date that you want the engagement to begin, but please don’t enter today’s date even if you’re ready to get started now. Remember, Accelerators can involve multiple work sessions with multiple people from your organization, and you need to ensure they are available. Did we mention that Accelerators are wildly popular? We’ve got an army of incredible specialists delivering Accelerators every day, and they are in hot demand. Plan to get started a week or two after submitting your request, at the earliest. Once your Accelerator request has been entered, it goes to our specialist teams for assignment. The specialist leading your engagement will contact you to schedule the kickoff call. It’s especially important for all stakeholders, including your executive sponsor, to attend the kickoff call. During this call, your team and the specialist will really dive into what the Accelerator is all about: the timeframe, what’s expected from everyone participating, and the expected outcomes. At the end of this call everyone agrees on a go/no-go for the Accelerator. If you’ve done your homework and picked an Accelerator that suits your goals, then this call should really get your team fired up to get started. It’s also perfectly OK at this point to acknowledge if the Accelerator is not a good fit for you right now, or even to pivot to a different one. Your specialist will be more than happy to work with your team to select an alternate if that’s the best path forward. Once everyone has agreed to proceed, make sure to respond to any requests from the specialist. These might be questionnaires or other assignments that will help with the discovery phase of the engagement. Don’t be the kid in the back row who never turns in their homework on time. Accelerators are not passive engagements. They require commitment and work, from both your team and the specialist. Do your best to keep the momentum going and the outcome will be worth the effort.